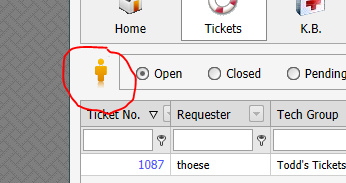 We have a user marked as a department head but for some reason they cannot see the tickets from the rest of the same department, they can only see their own. I should have noted that the user is not getting that option. I also thought that was the issue. Did you just add them as a department head? If so the user will most likely need to sign off (close browser) and resign in. Open Admin--Application Cache and recycle all. Also, I assume the department head is assigned to a department (i.e., it's not blank) in their user's record?